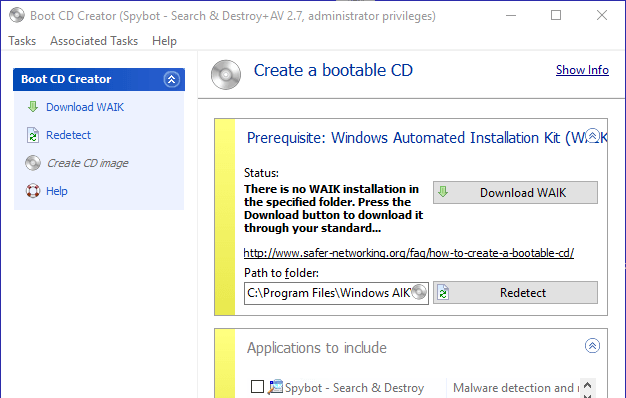 Boot CD Creator is a tool included in Spybot that creates a CD you can use to start your computer from. When there’s malware already active on a system, it might prevent anti-malware tools from detecting it. Starting from a Boot CD, you can fight the malware without it having a chance to activate itself. Boot CD Creator works by using Microsoft tools to create bootable CDs, and currently does not work on Windows 10. You can still create the bootable CD on a different machine to clean your Windows 10 computer though!